Most of Somalia remained dry between December 1 and 10, as the Deyr rainy season nears completion. However, localized light to moderate rains fell in southern areas of Lower and Middle Juba, Bay, Gedo, and Lower Shabelle. According to RFE2 satellite-derived images, these areas received between 10 and 50 millimeters (mm) of rainfall (Figure 1) during the reporting period. Given that most parts of the country do not receive much rainfall in December, the rainfall received in Gedo and Lower Juba was 10 to 50 mm above the 2005-to-2009 short-term mean (STM). However, this rainfall follows weeks of large rainfall deficits throughout the Deyr season. In all other areas, the lack of rainfall was either climatologically normal for early December, or a slight deficit (Figure 2). In the Northwest, no rainfall was received in Awdal, Sanaag, Sool, Togdheer or Woqooyi Galbeed from December 1-10. While dryness persists in all livelihood zones of this region, drought conditions are most severe in the eastern part of the Northwest. It was reported that more livestock migrated from Hawd Pastoral livelihood zone of Sool and Togdheer to Northwest Agropastoral livelihood zone of Woqooyi Galbeed in search of water and crop fodder. In the Northeast, no rainfall was received during the reporting period. 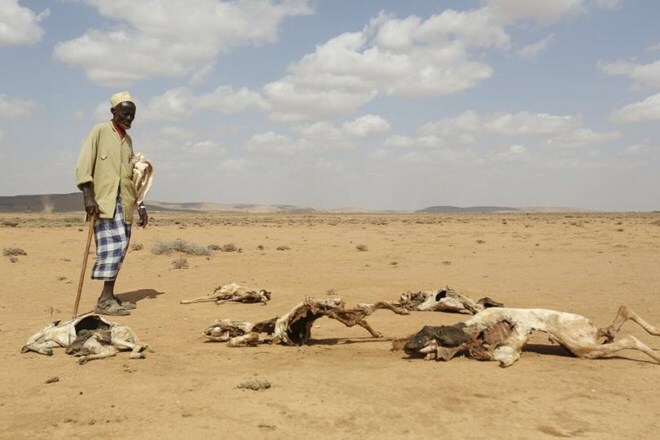 Atypical dryness persists in all livelihood zones of Bari, Nugaal, and northern Mudug. Rangeland resources and livestock body conditions are already very poor in this region and further deterioration is expected. Livestock migration options are limited due to widespread drought both within the Northeast and in neighboring regions. In central regions, no rainfall was reported in Galgaduud or southern Mudug. As minimal rainfall was received in central regions in the past few weeks, rangeland and water resources are deteriorating at a faster than normal rate. Significant livestock migration was reported from pastoral livelihood zones of Mudug and Galgaduud towards northern Hiiraan, where some rainfall was received in late November. In the South, localized light to moderate rainfall was received in Lower Juba, Middle Juba, and parts of Bay, Lower Shabelle, and Gedo. However, no rainfall was received throughout Bakool, Hiraan, or Middle Shabelle during the reporting period. Rain gauge stations recorded 12-30 mm of rainfall in Baioda, Qansahdhere, and Dinsor of Bay, 5 mm in Beledweye of Hiiraan, 6 mm in Bardhere of Gedo, and 20 mm in Sakow of Middle Juba. River water levels in the Shabelle River increased during the reporting period, as a result of rainfall upriver in the Ethiopian highlands. Increased river water is expected to support irrigated crops in riverine agricultural areas. According to the satellite-derived eMODIS Normalized Difference Vegetation Index (NDVI), vegetation conditions remain significantly below average throughout Somalia (Figure 3), although isolated areas in southern Somalia have improved as a result of increased rainfall in late November and early December. The seven-day rainfall forecast from the National Oceanic and Atmospheric Association’s Climate Prediction Center (NOAA/CPC) forecast little to no rainfall through December 20 (Figure 4).